Smartly designed and ruggedly built to withstand the most extreme environments, Orbital Systems’ antenna positioners and satellite tracking antenna systems are powerful, fast, high precision instruments suitable for Ka, X, S, and L Band tracking applications. These elevation-over-azimuth positioners are offered in sizes 1.8 meters through 5.0 meters and provide accuracy, flexible operation, and reliability unsurpassed in the industry. Standard equipment includes; feed mounting poles, antenna tracking controller unit, and a complete maintenance tool kit with every antenna system. Provides standard options for AC or DC power and 100BASE-T Ethernet or optional fiber. Flexible multi-band RF channels and multiple reflector size options are available in diameters 1.5m through 6.1m. Designed and built to meet the high performance and accuracy requirements of all demanding Low Earth Orbit (LEO) and Medium Earth Orbit (MEO) satellite tracking ground station solutions; Telemetry, Tracking and Control (TT&C), Earth Observation Satellite (EOS), Direct Broadcast (DB), RADAR, Search and Rescue Satellite (SARSAT), Unmanned Aerial Vehicles / Remotely Piloted Vehicles Tracking (UAV/RPV), trailer mounted, and other custom tracking applications. Reception loss caused by what is sometimes called a “keyhole effect” is eliminated by the high speed of azimuth rotation in Orbitals’ two axis products. When tracking a near overhead pass the 2.4m through 3.7m products use a predictive motion with a peak azimuth velocity of 60 degrees/sec, and acceleration at up to 60 degrees/sec². The 1.8m product does these motions at up to 50 degrees/sec. These very high speeds completely eliminate loss of signals on a worst case near overhead pass in X-band and below. Orbitals’ 5.0m positioner utilizes three axis tracking to reduce the worst case maximum tracking velocity requirement for a Low Earth Orbit (LEO) to about 7 degrees/sec allowing use at any practical frequency. 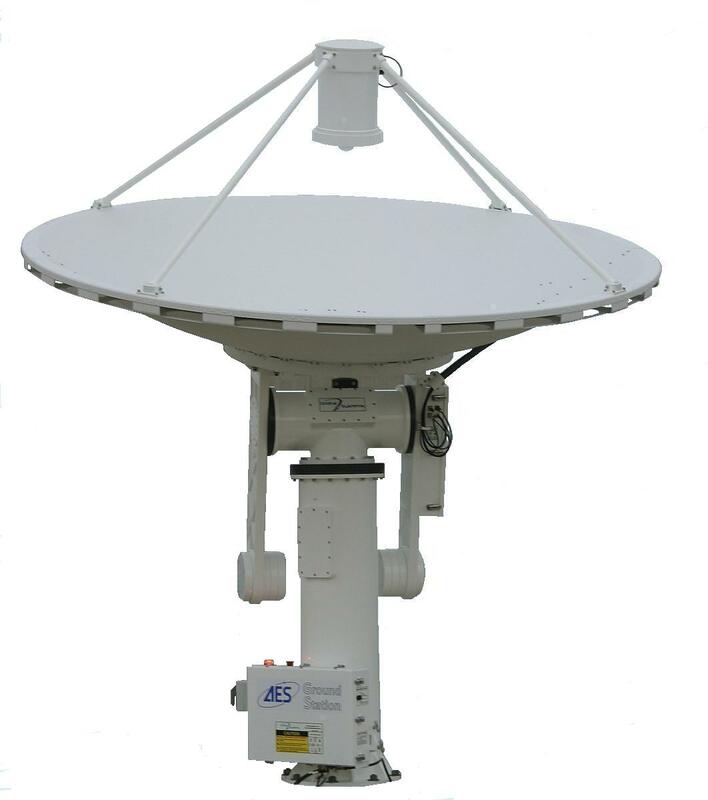 The 5.0AE3BP-5m is a three axis positioner for satellite tracking applications in Ka, X, S, and L bands. 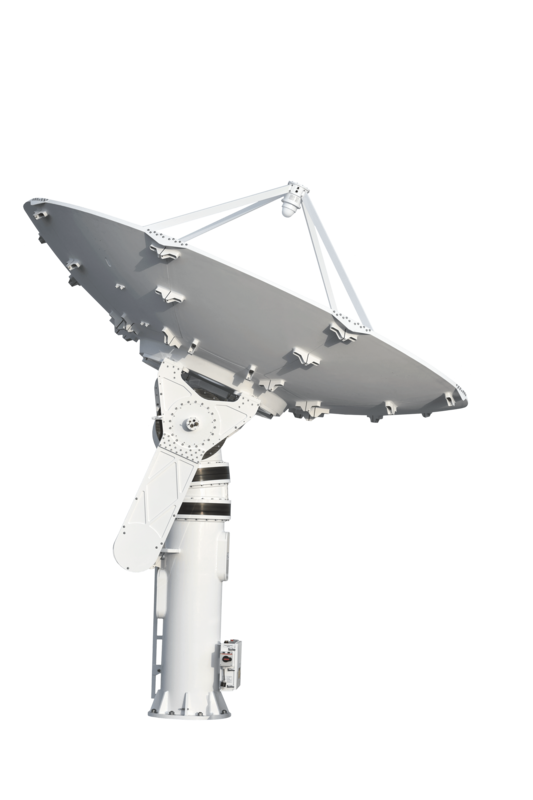 A high quality, high precision, elevation-over-azimuth satellite tracking antenna system designed with a third 7º tilt axis, composite reflector, and prime focus or cassegrain feed. The 3.0AEBP-3.7m antenna positioner is designed and built to provide high reliability while withstanding severe environmental conditions. 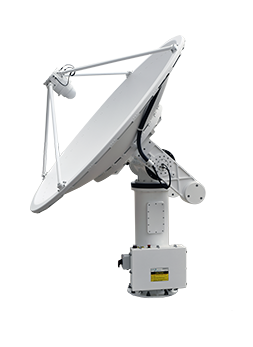 The high-quality, high-precision, elevation-over-azimuth, satellite tracking system is suitable for operation at X-band and below. The 3.0AEBP-3.0m antenna positioner is designed and built to provide high reliability while withstanding severe environmental conditions. 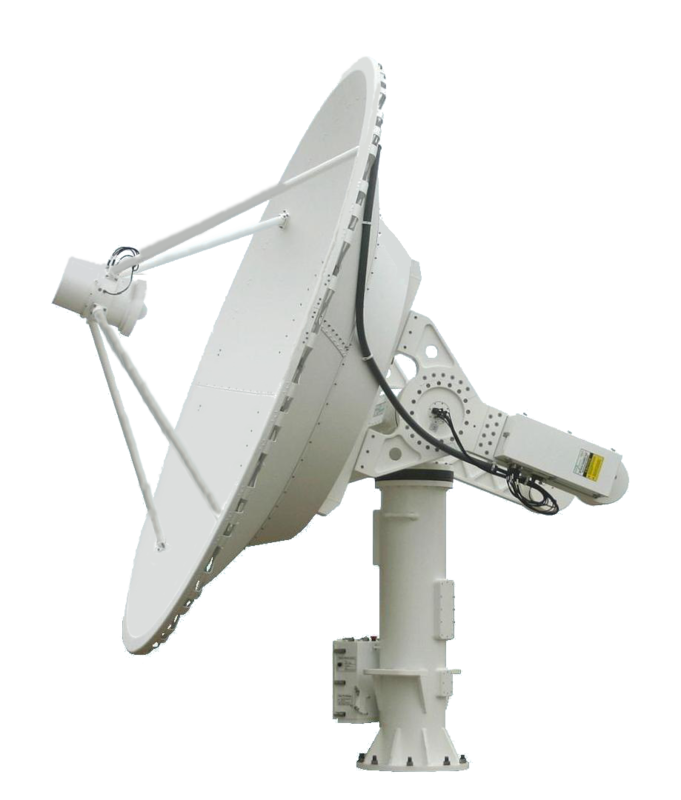 The high-quality, high-precision, elevation-over-azimuth, satellite tracking system is suitable for operation at X-S and L bands. The 2.4AEBP-3m starts with a 2.4AEBP basic mechanism that is equipped to handle a 3.0m reflector with reduced specification for maximum operating wind speed but is otherwise similar. The 2.4AEBP-3m has a number of mechanical changes to support this conversion, but the electrical and control interface is identical to the 2.4AEBP-2.4m. The 2.4AEBP antenna positioner is designed and built to provide high reliability while withstanding severe environmental conditions. 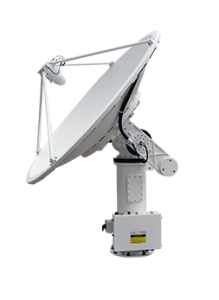 A high quality, high precision elevation-over-azimuth satellite tracking system suitable for operation at X band and below applications. Full performance 1.8m mechanism equipped with either a 1.8m or 1.5m reflector, remote GPS antenna with cable, satellite tracking ACU and a comprehensive service toolkit. 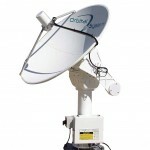 High quality elevation-over-azimuth satellite antenna system. The ACU Antenna Control Unit is a flexible antenna tracking controller that manages all aspects of an antenna system equipped with the Orbital Data Bus (ODB) technology, including the antenna positioner functions, and the antenna RF payload. The ACU is located inside the electrical cabinet; integrating all antenna and positioner functions on the ODB and providing user control access through an Ethernet connection. The ACU uses multiple processors to separate real-time control of the positioner and payload from management of the user control protocols. 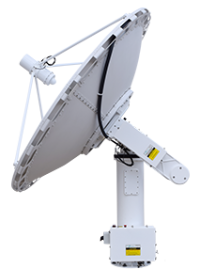 The ACU has been designed to facilitate customization for complex multi-axis antenna system applications. High speed, powerful servomotors provide precision positioning and rapid slewing. Standard reflectors are reinforced spun aluminum construction with surface accuracy to 18 GHz. Sealed mechanical systems permit pressurization of entire unit, including matching feeds, to eliminate damage caused by condensing humidity. Dynamic seals are rated to the last the life to the product and resist damage from sun, ice, ozone and blowing sand. Electrical systems are designed and built to meet stringent safety standards, and are CE marked. A variety of feeds are available for various applications. Custom feeds are available. See sidebar for design and construction benefits. General positioning applications – RADAR and camera tracking, etc. 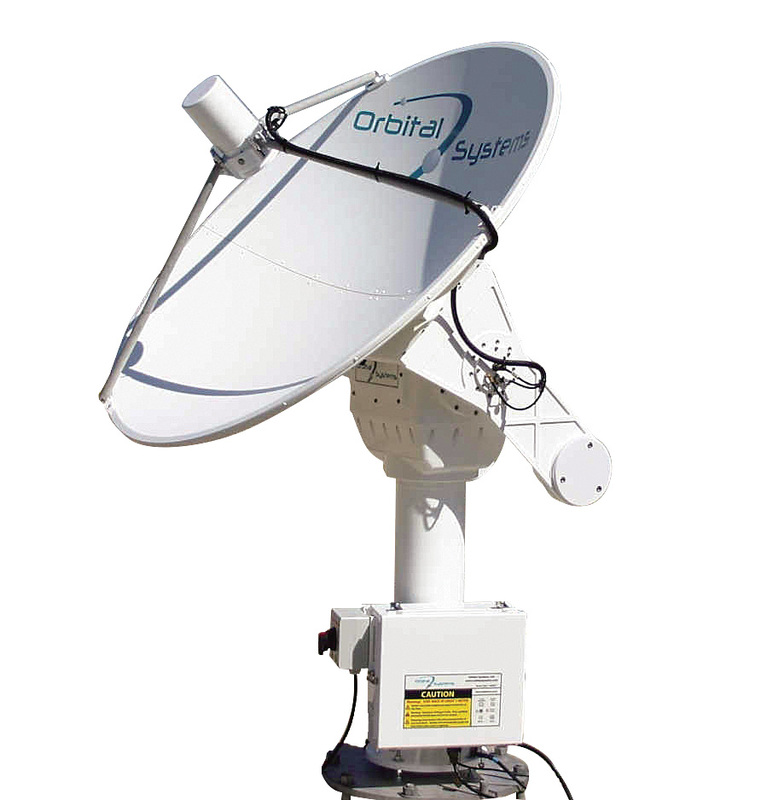 Need a complete Earth Observation Satellite (EOS) Direct Broadcast (DB) Reception System? Need a complete Telemetry, Tracking and Control (TT&C) System? Advanced engineering, superior materials and in-house manufacturing make our positioners intrinsically more robust and maintenance-free. Solid spun aluminum reflector with aluminum feed supports and reflector mount eliminates rust. Reflectors have high surface accuracy for excellent high frequency performance. Designed to drain and deflect rainfall away from the electrical cabinet where key components are housed. Entire system (positioner+feed) is sealed and pressurized with dehydrated air or nitrogen gas to prevent corrosion of controller, electromechanical parts and feed. This also eliminates internal rust problems such as failing brakes and weakened gears. Temperature and humidity sensors are monitored by the ACU which automatically purges the system when needed with fresh, dry air or nitrogen. By eliminating condensing humidity the reliability of the system is greatly increased. If pressurization fails – the antenna still runs. All designs use servomotors and 4 quadrant drives that minimize power consumption while providing full torque at near zero velocity. Elevation over Azimuth f﻿ully counterbalanced systems draw little power while tracking unless subject to significant wind load. Integrated mechanical system components, with IP65-rated brushless motors and internal brakes, matching motor drives tied to generously overrated heavy-duty gears. Gears and drives automatically heat as needed for full performance to -40°C. Gears are enclosed in a cast housing, to further protect gear lubricants from dust and moisture for maximum longevity. Built-in precision GPS timing and location reference. Positioners are controlled over RS422 links. RS422 to Ethernet converters are provided to simplify interfacing to control computer systems. Using the simple control interface TLE ephemeris is stored for each satellite and the antenna tracks on command by simply naming the satellite. No indoor rack space needed, controller located in electrical cabinet at base of positioner. High speed azimuth axis allows reliable tracking of X and L Band satellites with no keyhole effect. All structural metal is made from Aluminum with stainless steel fasteners to eliminate rust. Exposed surfaces are powder coated or hard anodized to maintain an excellent finish appearance for many years to come. Higher performance than most standard feeds: typ. 2.4m X-L performance is 24.5db/K and 8 db/K with considerable filtering in L band to eliminate mobile communications interference. Completely integrated with the communication control channel of the positioner. Built-in purge valve ventilates the entire antenna when excess humidity is detected in the electrical cabinet or feed. For positioners without slip rings and rotary joints, the internal flex cables that connect to the feed are rated for life of product.